If you think that all sign frames are created the same, you need to think again. There is a wide variety of options out there for you to choose from. However, if you need frames for exterior signage, you will want to seek out a product that is both durable and has a distinct appearance that will help it stand out. At The Sign Studio, our exterior outdoor frames for Los Angeles are made of top-quality aluminum and are sure to catch the eyes of passersby. Today, we are going to take a closer look at what options are available for your organization. What Are Exterior Outdoor Frames? Our exterior frames are suitable for any outdoor applications thanks to their construction. They are precision mitered from a premium aluminum alloy. Each frame is assembled by hand using stamped stainless steel corner angles. They are available in two hard-coat anodized colors, satin silver and satin yellow gold. This hard-coat finish makes the frame materials more resistant to wear. The frame has a one-eighth inch wall thickness and comes with an array of custom options. For instance, you can pick from frames that are 3” by 3” all the way up to 36” by 36”. Mounting options include silicon adhesive, double-sided tape, and our preferred method of mechanical fastening. We are able to put holes in the frame for easier installation. 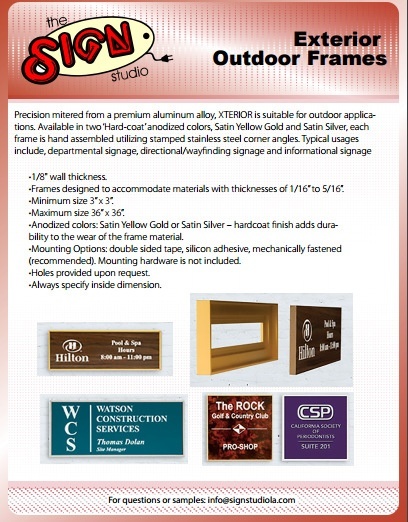 What Kinds of Signs Go in Exterior Outdoor Frames? 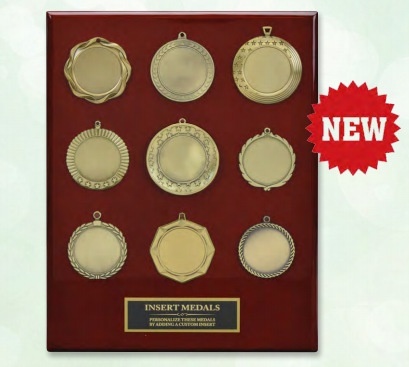 These frames are designed to accommodate materials with thicknesses of 1/16” to 5/16”. This means you can put a variety of different types of signs in them. If you are going to install your sign where it is exposed to the elements, we recommend using a heavy duty material. We suggest engraved signs. We are a bit biased since we have some of the best engraving machines in the region, but they produce affordable, customized markers that will look great for many years to come. Wayfinding/Directional Signs – If you operate a large facility with a variety of different rooms that need to be easily accessible, you can point the way with directional arrows or with simple directions for how visitors can find the room or amenity they need. Informational Signage – Do you have certain rules that people must follow upon entering your building? Make this information crystal clear by tastefully displaying the rules near your entrance in an exterior outdoor frame. Departmental Signs – Does your campus have a variety of different departments that guests and employees need to be able to locate? Make their search easy by clearly labeling each department with exterior outdoor frames. You can also use these frames to identify different suites within your complex. And, this is just a sampling of the ways you can use these frames. If you have some outdoor signage application that could benefit from exterior frames, call the friendly experts at The Sign Studio today for a free consultation. If you own or operate a professional office, you are well aware of the confusion caused by not having the appropriate signage. Workers, clients, and other guests are doomed to getting lost without sufficient markers showing them the way. Fortunately, The Sign Studio offers decorative bars and rails that make for great office signs in Los Angeles. There are essentially three main parts to a sign: the copy, the substrate the copy is engraved or printed on, and the mounting materials. Decorative bars provide a classy way for you to mount your office signs. We are able to create bold metallic borders for your signs with the four sizes of decorative bars. There are formats of right and left sides or bottom and top available. Other options include mixing two different sizes of bars or making a square with four equal sides. All options support a snap-in matte clear lens that keeps glare to a minimum. All of the parts of the decorative bars are individually anodized to give finished ends. There are five anodized finishes to choose from, including polished silver, polished yellow gold, satin silver, matte black, and polished rose gold. With a more subtle look than our decorative bar system, the decorative rail frame system is a simple, clean setup that has similar dynamics. When you are looking for a classic architectural appearance that does not break the bank, the decorative rail system is your best alternative. It is perfect for personnel nameplates, evacuation plans, and room identification. How Are Decorative Bars and Rails Used? Wayfinding Signage – Just because a sign is mainly used for functional purposes, it does not mean it can’t be fashionable as well. Show the way with style by incorporating decorative bars. ADA Signs – You are required to have specific types of signs in your building under the Americans with Disabilities Act (ADA). 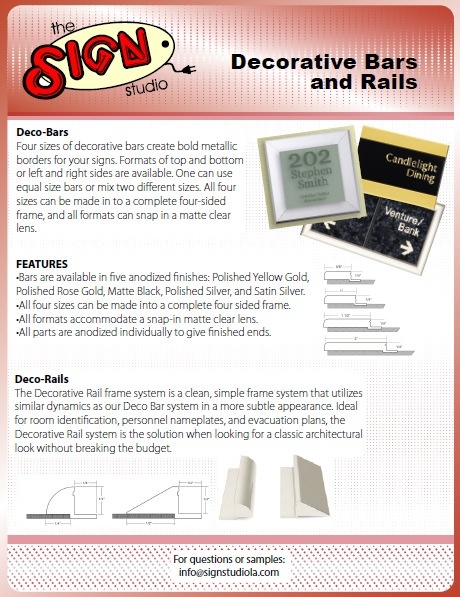 We know what is needed to meet these requirements and can help bring you into compliance using decorative rails. Suite Signs – Wayfinding signage tells guests where to go, but you need suite signs to show them they have found the right room. This should give you an idea of what is possible with decorative bars and rails. In addition, we can customize your signage with your unique branding, including matching your business’s typefaces, logo, and colors. If you are unsure about what office signs are right for your venue, don’t worry! The friendly experts at The Sign Studio listen closely to what you have in mind for your project. We then provide you with a variety of recommendation based on your goals, building, and budget. We then get down to work manufacturing and mounting your signs once you know what you want. Contact us today for a free estimate if you are interested in learning more! Half the struggle with office signs is trying to make them stand out enough so that guests, clients, and employees will notice them. With flat office signs that are flush-mounted to a wall, it is very easy for visitors and others to not even see these markers. This is why many professional offices are choosing to go with curved signage. 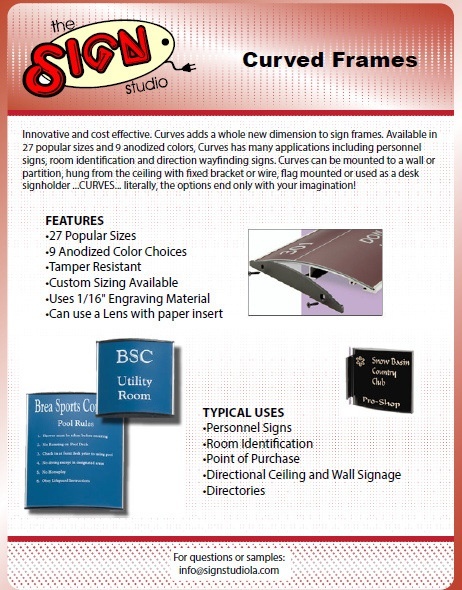 Thankfully, The Sign Studio is one of the premier suppliers of curved office signs for Los Angeles. How Do Curved Office Signs Work? Curved office signs are made up of two main parts: the frame and the insert. The frame comes in 27 popular sizes, and there are nine anodized color choices. The frame is either curved horizontally or vertically depending on how you want to mount it. They can be flag mounted, installed on a partition or wall, used as a desk sign holder, or hung from the ceiling with wire or a fixed bracket. There are fixed end caps to the frames that can be removed easily with a screwdriver when you want to change your insert. There are basically two types of inserts that can go into the frame. There are paper inserts that you can print out with your office computer. With paper, we provide a matte protective lens to keep the paper from getting mussed up. 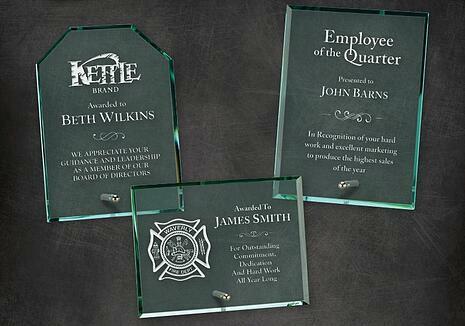 Or, we can fabricate 1/16” engraving materials for a more professional look. Our engraved office signs for Los Angeles can be made from an array of materials and in several different colors. We can ensure that your markers match your branding and your interior décor. How Are Curved Office Signs Used? Directional Signs – Whether you hang them from the ceiling or mount them on your walls, directional signs are helpful for pointing the way to various amenities and rooms. The curved design makes it easier for people to get where they need to go in a hurry. Personnel Signage – If you have a venue with dozens of offices and cubicles, you can make it simple for people to find each other by providing them with personnel signs. And, when a new employee arrives, you can quickly change out the inserts on the markers. Directories - Again, if aspects of your building change on a regular basis, it can be quite expensive and tedious to buy a whole new sign each time something changes. With curved directories, we can update your marker with affordable engraved inserts. Point of Sale – Do you have a receptionist who is constantly being asked the same questions over and over again? Save time by installing informational, point-of-sale signs that answer these questions. This should give you a good idea of how you might be able to put curved signs to use for your enterprise. If you are interested in learning about solutions that are specifically tailored to your organization, contact the friendly professionals at The Sign Studio today for a free consultation! 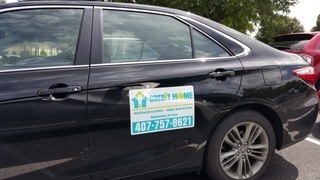 Car magnets are an excellent way to get your company’s name out there whether you are a restaurant owner, florist, landscaper, small business owner, housecleaner, caterer, contractor, realtor, or anything else. Fortunately, The Sign Studio is one of the top suppliers of car magnets for Los Angeles. Let’s take a look at some of the ways you can put these marketing tools to use for your organization. Before we get into their uses, we want to make sure you know what car magnets are. They are essentially vinyl signs that feature a magnetic layer that allows them to cling firmly to the sides of trucks, vans, cars, or any other vehicle. They are heavy duty and come in a variety of different sizes. You can attach them just about anywhere on any type of vehicle. You do not need a fleet of vehicles for your company when you have car magnets. Instead, any truck can be part of your fleet when you order personalized magnets. You can share magnets among many vehicles to save some money. If your business has employees who travel to job sites or make deliveries using their personal vehicles, car magnets are the perfect way to have them temporarily advertise your enterprise while on the clock. This will also give your fleet a professional appearance that will inspire trust in prospective customers. One of the most popular ways to market on a vehicle is with a car magnet. They are basically billboards on wheels. Only they are better. Billboards rely on your potential clients driving by them. When you put car magnets on your vans, they will go where the consumers are. You can put the magnets on the back of your vehicle, on the sides, or in all three spots. Since people have the most time to read what is on the back of your truck, we recommend putting your magnet there. Car magnets are not permanent like vinyl adhesive films or paint jobs. You can take them off and put them back on as much as you would like. They also do not leave any adhesive residue behind. 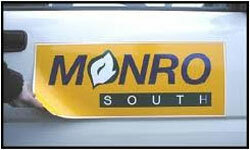 You can use car magnets without worrying about causing damage to your paint job or hurting your car’s resale value. In addition, you may just want to be completely off-the-clock sometimes and not have an advertisement for your business on your vehicle. Car magnets make this possible. These are just some of the reasons why car magnets are a smart investment. They are both affordable and effective at marketing businesses of all varieties. The friendly experts at The Sign Studio are skilled at making vehicle magnets for Los Angeles that catch eyes. With our state of the art software and large format digital printers, we can perfectly match your corporate colors, fonts, and logo to keep your branding consistent. 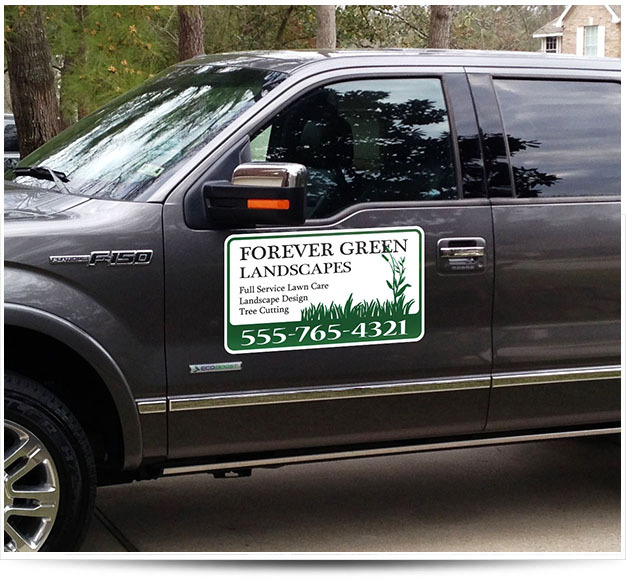 If you are ready to put car magnets to work for your company, contact us today for a free estimate. If you read our blog regularly, you may have noticed that we have gone a little “engrave crazy” in recent weeks. We can’t help it! Our new laser engraving capabilities are already helping several businesses in the Los Angeles area, and we want to get the word out about how we can provide affordable solutions for your enterprise as well. Today, we are going to take a closer look at laser engraved architectural frames for offices in Los Angeles. 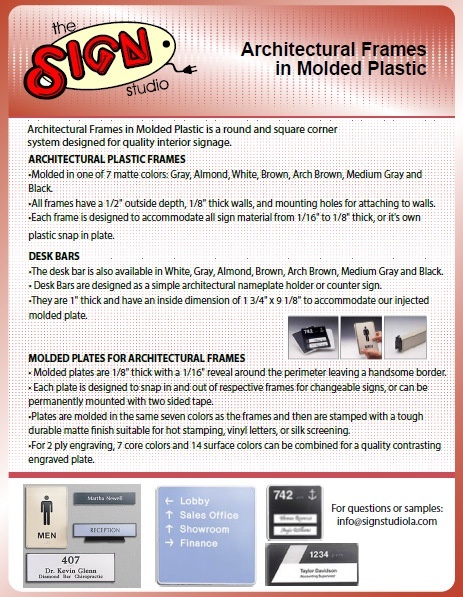 If you are looking for a high-quality interior sign system, look no further than molded plastic architectural frames. They come in a wide variety of styles. There are square and round corner systems. You can choose from seven matte colors, such as medium gray, brown, almond, black, arch brown, white, and gray. The molded plastic frames are designed to work with their own engraved plastic snap-in plate, or they can accommodate any sign material between 1/16” and 1/8” thick. All of the frames have 1/8” thick walls, a half-inch outside depth, and they have mounting holes for easy attachment to your walls. Desk bars are also available in the same colors as the other molded plastic frames. However, they are designed as simple architectural counter signs or nameplate holders. They are one-inch thick with an inside dimension of 1.75” by 9.125”, which is perfect for our injected molded plate to fit right in there. 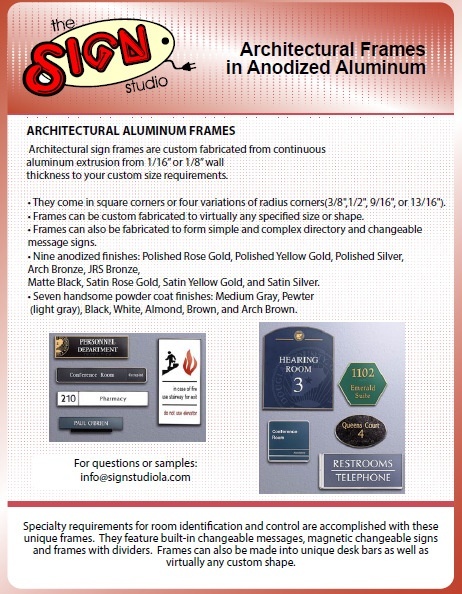 Anodized aluminum architectural frames also come with several options. Again, you can choose from square corners or from one of the four different radius corners. They come in just about every shape or size. 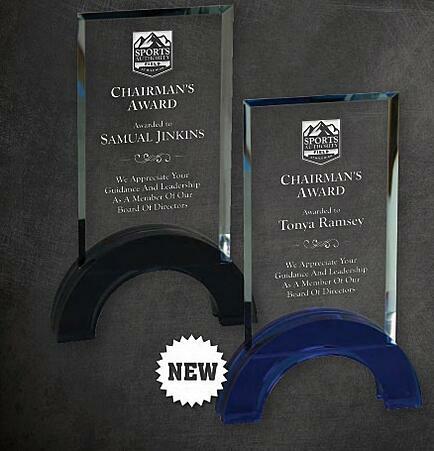 Our aluminum frames are ideal for engraved changeable message signs or for complex and simple directories. They come in nine anodized finishes, like arch bronze, polished yellow gold, satin yellow gold, matte black, satin silver, satin rose gold, JRS bronze, polished silver, and polished rose gold. But, that’s not all! You can also pick from seven powder coat finishes. We are talking about brown, white, pewter, arch brown, almond, black, and medium gray. There is sure to be a solution that perfectly complements your interior décor! What good are frames if you don’t have the engraved plates to put in them? We, of course, have those for you too. We can engrave just about anything, but for ease of use with the above architectural frames, we have standard sizes that can snap right in or out. Or, we can mount your plate permanently with strong two-sided tape. 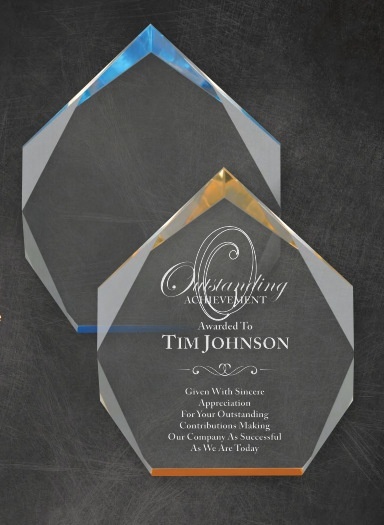 We perform two-ply engraving, where fourteen surface colors and seven core colors are combined for a quality contrasting engraved plate that will meet the standards set out by the ADA. Are you unsure about what is right for your building? No problem! Our experts are more than willing to sit down with you and discuss what solutions are best for your organization. We take your budget, venue, and vision into consideration before making recommendations. For a free consultation on laser engraved architectural frames for offices in Los Angeles, contact The Sign Studio today!